지장보살본원경은 줄여서 ‘지장경’이라 부르기도 하고 지장신앙의 기본경전이다. 지장보살이 여러 가지 모습으로 중생을 교화하고자 노력하여, 죄를 짓고 지옥에서 고통받는 중생들까지도 평등하게 구제하고자 하는 큰 뜻을 담고 있다. 이 책은 당나라 법등(法燈)이 번역한 것을, 조선 왕실에서 태종의 비인 원경왕후와 세종의 비인 소헌왕후의 명복을 빌기 위해 목판에 새겨 닥종이에 찍어낸 것으로, 3권이 한 책으로 되어 있다. 형태는 병풍처럼 펼쳐서 볼 수 있도록 되어 있고 접었을 때 크기는 세로 28.2㎝, 가로 18㎝이며 한 장에 5행씩 들어가도록 되어 있다. 책 끝부분에 있는 기록을 보면, 세종의 막내 아들이 영응대군의 군호(君號)를 받은 세종 29년(1447)에서 세종이 승하한 1450년(세종 32년) 사이에 간행되었음을 알 수 있다. Ksitigarbha pranidhana Sutra tells of how Ksitigarbha Bodhisattva made great vows to rescue sentient beings. Originally translated by Fadeng of the Tang Dynasty, this sutra was inscribed on woodblocks and printed on mulberry paper. The publication was ordered by the royal family of the Joseon Dynasty to pray for the deceased souls of Queen Wongyeong (wife of King Taejong) and Queen Soheon (wife of King Sejong). This book consists of three volumes and measures 18 cm wide and 28.2 cm long when folded. 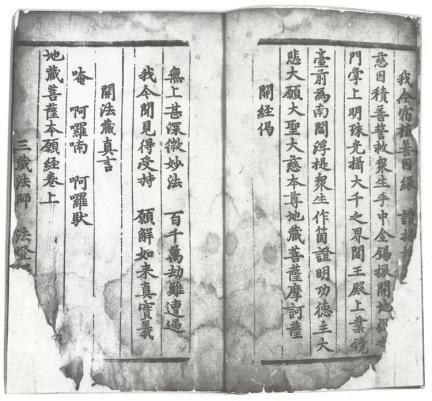 According to the record at the end of this book, it was published between 1447 (29th year of King Sejong’s reign) when the last son of King Sejong was conferred the title of Prince Yeongeung and 1450 when King Sejong died.